North Lanarkshire Council Leader Jim Logue, John Lee, Chair of the SAIP Campaigns Group and Head of Policy and Public Affairs, Scottish Grocers Federation and Superintendent Rob Hay, Police Scotland. Following its success in North Lanarkshire the You’re Asking For It campign has developed an online resource to support its roll-out across Scotland. Over 300 retail outlets backed the North Lanarkshire campaign which raised awareness of the damaging effects and criminal nature of buying alcohol for under 18s. Fourteen proxy purchase hot spots were identified and Scott Porter Research found there was a 34 per cent increase in awareness of current legislation. Over 100 people attended a launch event for the resource in Motherwell including representatives from 17 local authorities, Police Scotland, the retail sector, alcohol producers and health workers. 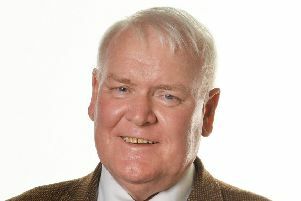 John Lee, chairman of the SAIP Campaigns Group, said: “I commend the tireless work of council colleagues, Police Scotland, the retail community and public for rallying behind the campaign.